Wow, I'm posting a little late today, huh? It's still the 30th though, so I haven't failed this challenge yet! Today's "inspired by a tutorial" nails come from the cool mermaid nail look by Little Nails. I chose to use a different color scheme and go for a bit of a "candy mermaid" look. The polishes I used for this are: OPI Do You Lilac It?, OPI If You Moust, You Moust, China Glaze Strawberry Fields, Lime Crime Parfait Day, Lime Crime Milky Ways, and Zoya Marley. This look basically just involves layering dots. If you want a visual tutorial, make sure to check out the link above to the Little Nails post! Doing five of these nails took about 45 minutes for me. Not the speediest look, but in this case, if you don't take the time you don't get the results! You really gotta go slow and make sure to place the colors so they are nicely spaced out. I'm totally in love with this style! They look so awesome up close AND at arm's length. Thanks for the great tutorial, Little Nails! Gorgeous! I love the colors you've chosen for this one! I LOVE it! I was having a pretty hard time trying to figure out what look to re-create for tomorrow, but now I know that it has to be this one! I don't know if I'll have the patience to do all of my fingers though. I'm pretty anxious for this challenge to end. I've been meaning to try this design! I would probably have the patience to only do one nail, haha. Your mani turned out beautiful, as always!!! Thanks for your grateful informations, this blogs will be really help for HTML tutorial. I love this design, I will have to try this too:) Great color combination! Ooooh wow, love this one so so much! this looks like it took hours to make :D gorgeous work! I love this! Great choice of colors! Stunning! I absolutely love this. Some day when I'm calm and have lots of patience I will try it. It looks so beautiful, what a fantastic job!! This is gorgeous- and would look great with so many different color combinations- I'm going to have to try it. Haha pretty - and it matches your new layout! I love this and I love the colors you chose!! Wow, So pretty! Great colour combos! I LOVE this look! I've been meaning to do it ever since I saw it, but 1) it will take me too much time, 2) I am not sure which colors from my polish stash to combine. 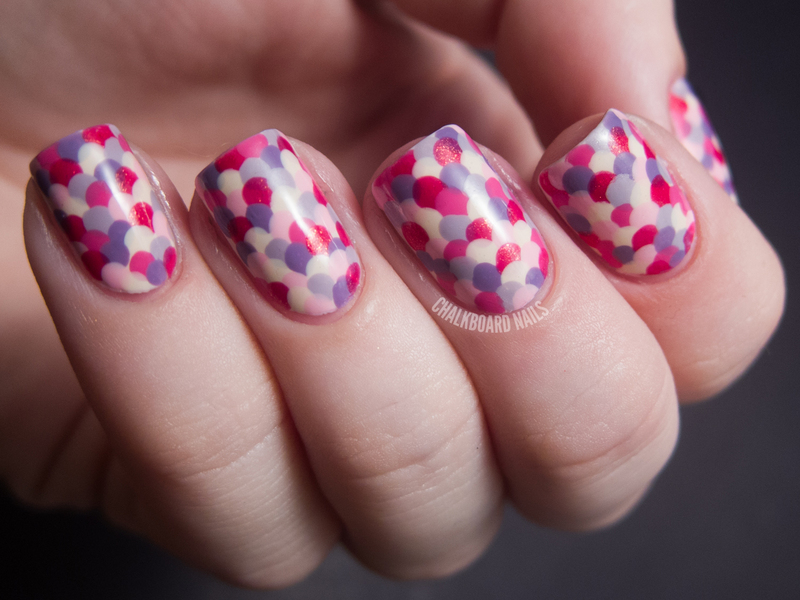 gorgeous - I've always loved this mani, but keep putting it off due to the time involved. Do you have a tutorial for this or know one?! This looks awesome! The link to the tutorial is at the top of the post. WOW!! I'm loving the candy mermaid! It looks absolutely gorgeous and seriously, you must have such patience to do all your nails mermaid style! I always limit myself to just a few nails if I'm doing it or I just end up frustrated. oh, this is very pretty and sweet! It is so nicely done. Whew! I came to your page to get a better idea as to what some of the prompts mean for this last group of 10 and I'm so glad I did! I thought we needed to DO a tutorial for this one, and I was planning on missing this day. I'm so glad I just have to FOLLOW a tutorial instead!